When my content is ready, how will I know? Clicking on the View button will bring you to a page where you can read the draft. What do I do after I receive my content? First, review the content to make sure it meets your needs. Then, approve your content — or request revisions within five (5) business days. Please note: If you have not responded within this time, we assume your satisfaction and approve the content on your behalf. After receiving notification that your content is ready, you have up to five (5) business days to approve or request revisions. This review period applies both to first drafts and revised drafts. Note: To give you more time, the review period begins on the next business day after you receive a draft. Prose business days are from 9 am to 6 pm ET. For example, if you receive content at 5 pm ET Friday, March 1, your review period will start at 9 am ET Monday, March 4 (and conclude Friday, March 8, at 6 pm ET). If the project was a one-time order, we close the project and charge your account. If the content was part of a recurring order, the recurring project remains open, and no further action is taken — recurring content is billed monthly, in advance. What if I don't love the first draft? Can I request revisions? Absolutely. All projects come with up to two (2) rounds of free revisions. In our experience, projects rarely require more than one round of revisions. If, after two rounds of revisions, the content still does not meet your needs, please contact us to discuss additional options. What is the process for requesting revisions? 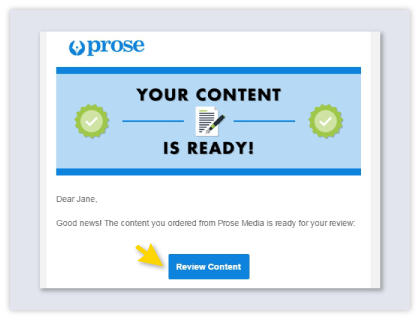 Prose will notify you via email when your content is ready. Just click the link in your email (or on your dashboard) to view the completed draft. The Request Revisions button is at the top right of the document itself. 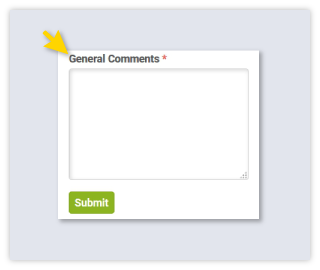 Click this button to insert comments in the margin and/or make general comments. Step 3: INSERT SPECIFIC "COMMENTS"
Use the “Comments” feature to give us feedback about specific words, sentences, or sections of text. Just click on the button next to the paragraph and type your comment in the pop-up box. Then click Post. Note: For each paragraph, you can post as many comments as needed. Step 4: PROVIDE GENERAL, OVERALL "FEEDBACK"
In addition to leaving marginal comments on specific pieces of text, you can also leave general feedback about issues that relate to the draft as a whole. For instance, you may want us to adjust the overall tone (“More enthusiastic!”) or reiterate a universal formatting preference (“Boldface all subheadings”). Type your comments in the “General Comments” section. Important: While the “Feedback” feature invites you to comment on the piece as a whole, please make your general feedback as specific and actionable as possible. All feedback should be "on-brief," which means consistent with the instructions in your original content brief. Once your feedback is complete, click the green Submit button. Prose will confirm receipt of your feedback via on-screen or email confirmation. Check for confirmation that the system has received your request. 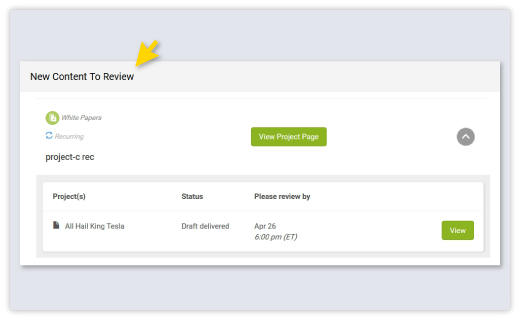 As soon as Prose receives your revision request, we will begin implementing the feedback and changes you’ve requested. When the revised draft is ready for your review, we will notify you via email. The same procedures apply as when you received the initial draft. Once you’ve made a revision request, please allow up to three (3) business days to receive the revised draft. The revision review period begins on the first business day after you have made the request. The period concludes at 6 pm EST on the third business day. Longer manuscripts or more complex projects may require more than three business days to revise. In such rare cases, Prose will contact you to arrange a delivery date. Who will make the revisions, the writer or the editor? Most requests for revision are addressed by the writer and editor. The editor most familiar with your account and brand will make relevant changes and, if necessary, involve your writer. The editor will always review any edits made by the writer before returning the draft to you. Revisions are critical to your total satisfaction, and Prose is pleased to provide this additional level of oversight and quality control. What type of revisions can I request? Prose wants you to be genuinely delighted with your content. You are the boss. You may feel a point needs clarification, or you may want to change the overall structure. 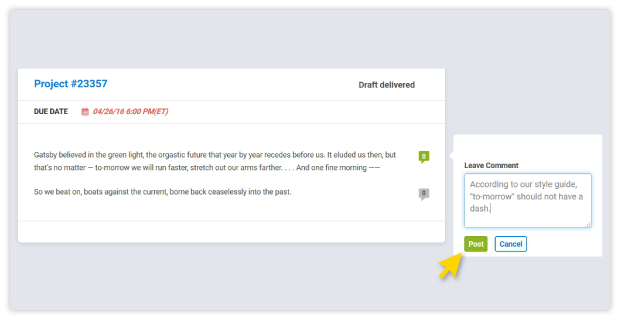 You can request changes to words, sentences, paragraphs, or titles. You can ask us to add humor or turn down the stylistic volume. As long as your revision requests are “on-brief,” we are happy to comply. By “on-brief,” we mean consistent with the instructions in your original content brief. Obviously, revision requests should never change the project definition or scope. Why do revision requests need to be “on-brief”? Shouldn't I be able to request any revisions I want? Everyone wins when expectations are clear. Best practices demand that all revision requests be “on-brief” — i.e., related to initial project instructions. We know that important details can inadvertently be omitted from a brief. We also understand that it’s easier to react to a draft than to take the time to provide adequate guidance at the start. But this is what happens behind the curtain: Your writer jumps into action based on a brief that details your vision and preferences. He or or she devotes hours to creating polished, on-message prose — only to discover that you prefer a different direction. Project planning must occur before or during the briefing process, not after the piece has already been written. The content brief is the time and place to determine how your piece should be written. Just as an architect and a client must agree on a blueprint before the house is built, a writer needs a detailed plan in order to construct quality custom content. 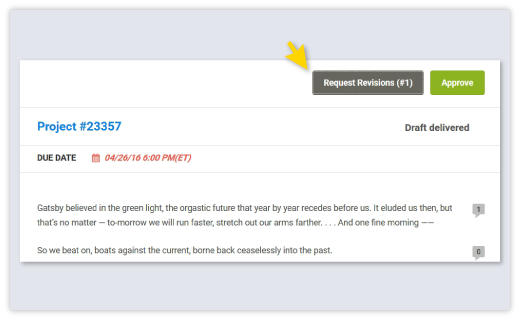 What is the smartest, most efficient way to request revisions? Please click here for a blog post on best practices for requesting revisions. What if I want to revise the content myself? Prose offers up to two rounds of complimentary revision to ensure your satisfaction. Of course, it’s your content, so you’re welcome to perform the revisions yourself, if you prefer. Please note that if you choose to forego our value-added revision service and revise the content yourself, it does not alter the terms of our agreement. All projects are auto-approved and billed five business days after delivery, unless you’ve submitted a revision request. Please also note: We offer two rounds of complimentary revision with the understanding that any revision requests are "on-brief." If your edits have significantly altered the structure or scope of the project (for example, by the addition of new material, or by rethinking the topic), we may be in touch to discuss additional charges. Can I share feedback with Prose to improve my content for next time? Absolutely! Our editors want to know about your preferences so we can meet or exceed expectations each and every time. Your feedback helps us select writers for future projects, fine-tune the editing process, and create a better service — from platform to process. 1. After each project, fill out a two-question survey. Once you approve a piece of content, share your feedback. Rate the work (from 1 to 3 stars) and jot down a comment, including suggestions for improvement. 2. If a draft misses the mark, request revisions. It's easy to request edits. Revisions are part of our service because Prose wants you to be completely satisfied with each finished product. Unlike most content marketing services, every revision request is reviewed by your writer and editor, so that we can apply your preferences to future projects as well as to the one at hand. 3. Send us feedback at any time. Reach out and let us know what’s on your mind. We realize that first drafts don't always meet the mark. That's why we offer up to two rounds of complimentary revision. In nearly all cases, revisions solve the problem. Any remaining issues are most often the result of vague or incomplete instructions. If you still wish to reject a draft after two rounds of revisions, please contact us to discuss. Prose aims to ensure that all of its Clients are happy. If for any reason Client is not satisfied with any deliverable received from Prose (“Work”), Client should alert Prose immediately. Client must tell Prose the reason(s) it’s dissatisfied with any Work via the electronic link provided upon submission of the Work for review. If Client does not so inform Prose, Work will be deemed approved seven (7) days after its delivery to Client, and Client’s credit card (or other primary payment method use by the Client, including, but limited to, check or bank account) will be charged. If Client informs Prose that it’s unhappy with the Work, Prose will offer up to two revisions of the Work for no extra charge. After each revision, the Work will be deemed approved seven (7) days after its delivery to Client and Client will be charged, unless Client informs Prose otherwise. If Client is unhappy with the work after two revisions are complete, Client must inform Prose immediately, including any reason(s). At this point, Prose will review the scope of services requested by the Client, the Work itself, all communications between Prose and the Client, and any other relevant information, and will determine on a case-by-case basis how to resolve these issues. For further information or any questions, please e-mail support@prosemedia.com. I was not happy with my initial project. Goodbye, Prose? Prose strives for 100% satisfaction, but occasionally a first try misses the bull's-eye. That's why we offer two rounds of complimentary revisions. The learning curve is on our dime. Let us know what didn't work for you, so we can revise and adjust to your preferences. If you had an issue with the process of ordering and receiving content, we more than welcome suggestions and feedback. The best relationships grow with familiarity and experience. Some of our most loyal clients had initial projects with Prose that failed to hit the mark. Today, they value Prose as an integral part of their in-source team. We have seen this play out time and time again.